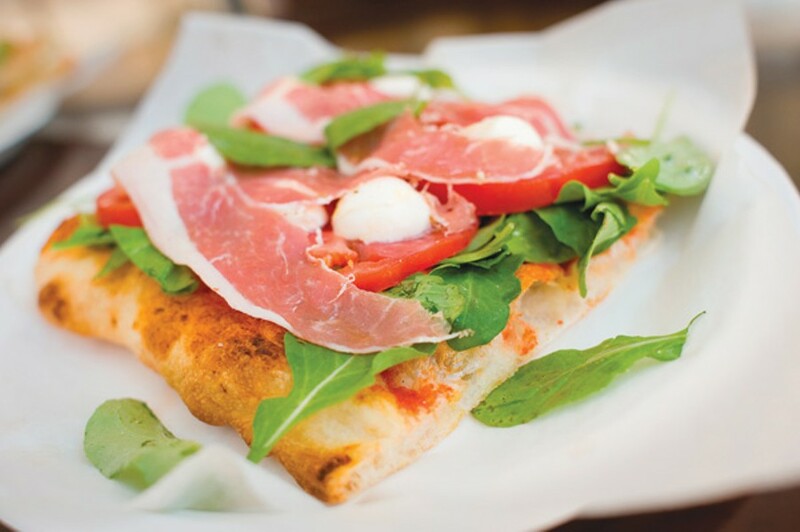 An authentically spicy slice of Italy opens in Downtown Berkeley. Chris Duffey The pizza comes topped with everything from prosciutto to mushrooms to black Mission figs. Hours: Mon.-Thu. 6:30 a.m.-9 p.m.; Fri. 6:30 a.m.-10:30 p.m.; Sat. 9 a.m.-10:30 p.m.; Sun. 9 a.m.-9 p.m.
Cash, all major credit cards. Bought as an afterthought, to be eaten on the walk home, a soft chocolate biscotto resembles a row of brown crayons melted together. One bite, blocks away, and it stops you dead in your tracks, so sudden and so shocking is its glory. Countless pastries are sold in countless cafes every day, most too greasy and sweet to tell apart. But this: Its chewy-crunchiness, its fruit, pine nuts, quality cocoa, and a circumnavigator's hoard of spices — those dark, throbbing, way-beyond-cinnamon notes that only royalty could once afford — is the cookie equivalent of chimes. To eat this while doing anything else would be a crime. Its protein-richness evokes panforte, the medieval pilgrims' Powerbar. Yet its savvy spicy-sweetness is fit for a king. That's the wonder of Italian food: Components and techniques so sure and pure that even staples stun. Few cuisines achieve this. It's why Italian food is especially infuriating when it's ersatz. "I see red when I see Olive Garden; nothing could be less Italian," fumed Nicki Rivieccio, who grew up in Torre del Greco, near Naples, and who helmed award-winning pizzerias in Sacramento and El Dorado Hills before opening Pane Italiano Qualitá — or PIQ, pronounced "peek" — in downtown Berkeley this summer. In its basement, master bakers from Rome and Milan use an array of imported machines — including an Agiv Forni oven and a multi-fixtured planetaria mixer — to create an ever-shifting range of sweets and savories. One machine produces biga, the stretchy, sourdough-ish starter that makes focaccia fluffy. PIQ's head baker is retired soccer-star-turned-pizza-maven Rufo Verga, who represented Italy in the 1992 summer Olympics. He and his team begin work at 2 a.m. At 6:30 a.m., customers start settling into sleek espresso-colored wooden chairs at sleek espresso-colored wooden tables spaced widely on caramel-colored hardwood floors between butter-colored walls in a genteel split-level space formerly occupied by Sun Hong Kong. Covered sidewalk seating strives to redeem a stretch of Shattuck Avenue that regulars know as often loud, screechy, and litter-strewn. Wide open spaces are PIQ's only Americanism. At popular cafes in Italy, "they don't give you a chair to sit on," Rivieccio laughed. "Italians would rather stand and mingle. If you hosted a party and you sat everybody down, nobody would get to meet anybody new." Traditionally, Torre de Greco men go to sea in their teens to join the coral trade. Rivieccio went to sea as a bar manager on cruise ships. That's how he met his wife, an American with whom he moved Stateside in 1976. "I'm more American than Italian now, but my soul is always in Italy, and I'll do anything to promote the beautiful stuff I grew up with," he said. It's beautiful, alright: Like a parade of gleaming show-off soldiers, row upon row of pretty baked goods is stuffed and topped with seasonal produce, meats, eggs, and cheese. ("Italy produces about 1,400 different cheeses. People think France is the place for cheese," Rivieccio declared, "but really it's Italy.") Lofty focaccia Valdostana. Pocket-like fazzoletti, named after folded handkerchiefs. Gleaming panini. Pizzete. Savory briochi. Elaborate calzone that are as elegantly light as éclairs. Sold whole and by the square, just as it is in takeaways in Italy, sometimes chewy and sometimes melt-in-your-mouth thin-crusted pizza comes lightly topped with everything from potato to prosciutto to mushrooms to perfectly ripe black Mission figs, paired one day with gorgonzola as a stroke of pungent, honey-sweet early-fall genius. "I'm on a mission to let people know what Italy is really like," Rivieccio said. "Although it's getting homogenized, with recipes from the north now being cooked in the south, in the old days every region was true to its culinary culture, very puritan. When I was a little boy, fusilli" — corkscrew-shaped pasta — "were made one by one, by hand." The parade marches on with sfilatini, Italy's airy answer to baguettes. Burnished bite-size rolls bear baked-in bits of meat. Master-snack "flutes" are foot-long soft breadsticks studded flamboyantly with green olives. 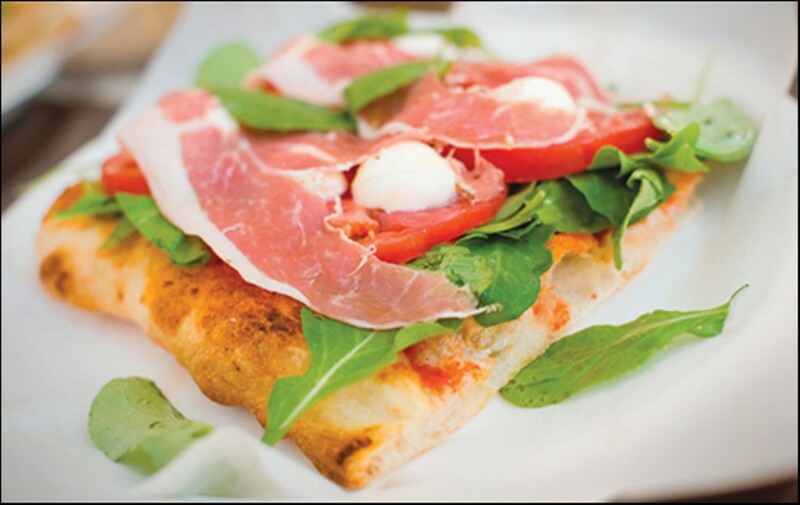 One of many different types of focaccia is strewn with arugula, tomatoes, and fresh mozzarella so resplendently mild as to prove what cheese can do without even having to try. And that's before we even reach the pastry case. It holds fruit tarts, nut tarts, cookies, cakes, and more, jeweled with almonds and chocolate and cream swirls, most of them marrying medieval to modern, royal to rustic. PIQ's cannoli is stuffed with ricotta cream so light yet so sophisticatedly spiced that it transports you to some distant place with sun-soaked colonnades. The pears in a strudel (to be eclipsed by other strudels bearing future seasons' fruits) are firm, as if to prove how recently they hung on trees. With chocolate, jam, and spices, they're enfolded in what look and taste like a thousand exquisite layers of paper-thin pastry, sprinkled with snowdrifts of powdered sugar. We who would eat sweets and only sweets if we could get away with it might make a case for making meals of this. It lasts longer with a cup of the velvety-smooth, oakwood-roasted-in-Oakland Mr. Espresso coffee that Rivieccio deems far fresher than imported Lavazza or Illy. For him, it's all about the freshness. "I remember being fourteen years old and working as a delivery boy," he said. "I remember the fresh bread coming from the ovens at 6 a.m., then going off with it on my bicycle, doing deliveries, having some of it for breakfast with fresh prosciutto and fior di latte from the mountains, then going to school. "In those days, I had the pleasure of eating in ways that nurtured the soul and all the senses. Everyone closed their businesses every day at lunchtime and ate as if it was Thanksgiving. If there weren't five or six dishes on the table when my dad came home for lunch, he would ask my mom, 'What's wrong today? There's nothing to eat.'"